Yup. Another washi Tape piece. This time, I use the washi as a backdrop for my focal-point stamp. Again, this one is on the CD (Washi Tape+Ribbons, on sale HERE for 15% for one more day). I used a new stamp: Stand Tall, #SD for my main image. I just added it to my site today! The image was colored with markers. 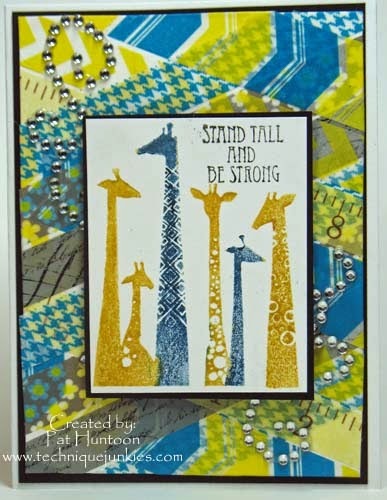 I love giraffes, so this card -- and the stamp -- is one of my favorites. Very dimensional in person, too. Check out that CD! Meet the New Technique Junkies Design Team! I am absolutely thrilled to announce the 2015 Technique Junkies Design Team! These ladies are well established stamp artists with an eye toward techniques -- exactly what you would expect for representing the Technique Junkies product lines. Although their "terms" don't start officially until March 1, I want to give you insight into their artistic world! I am so excited to have these ladies on my team! Welcome, ladies! Sometimes the simplest ideas are the best. Ideas that just work -- things that don't take hours to do. 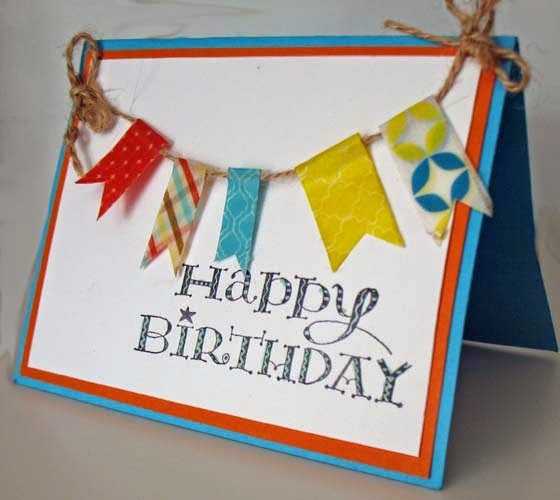 I love this technique - Washi Tape Banners from the Washi Tape + Ribbon CD -- for just that reason. Simple, fun and effective. Don't forget that the Washi Tape CD is on sale right now for 15% off. to get the discount, you must order it from this page: http://www.stampcamp.com/specialty-cds.html. The CD is normally only $9.95; with the discount it is only $8.46 plus shipping. Quite the bargain! Hurry, though, the CD will only be on sale through the stroke of midnight on Friday. The great thing about this CD is that there are 33 ways to use Washi Tape. Are they hard? No...but that's the idea. You will use that tape in ways you most likely wouldn't have thought of. Let me help you use that stash! Are you on my mailing list? Every Friday I am sending out an email with tips, techniques, ideas and discounts -- make sure that you are subscribed to it! If you are not and you want to be on it, send me an email and I will add you: phuntoon@optonline.net. The only stamp used on this card was Happy Birthday, #SD577. It is only $3.50 and can be found HERE. Happy stamping!